Time Person of the Year – YOU! 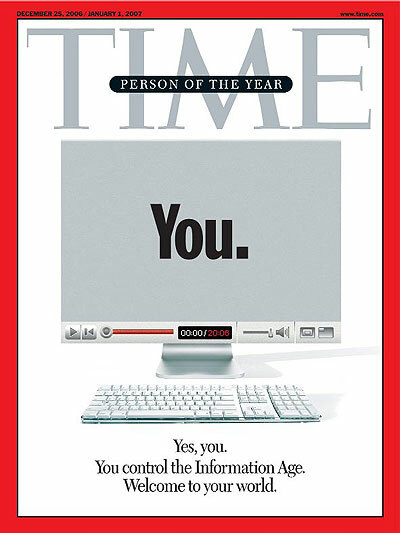 Time has decided that the Person of the Year is YOU. I could not agree more! Well, I think that Time is spot on. 2006 is the year that people realized that playing field has been leveled. No longer do you need a record contract to have a hit song. No longer do you need to be on Saturday Night Live to have you 4 minute comedy series seen by millions each week. No longer is the video footage on war what has approved for our sensitive eys. These things are all controlled by you. You create the media and you decide what to watch. I say that Time hit the nail right on the head. We are all witnessing the transfer of power that is taking place in the Information Age. And that power is being transfered to you. Maybe the talking heads on the FOX’s of the world are concerned and that is why they are calling it a joke. This is my first post. Not completely sure what direction this blog will take. Welcome and thanks for taking a look!